Aspergers101 welcomes Stephanie Pepi, founder and director of Starfish Social Club as an underwriting sponsor to our newest resource: Aspergers101 FAQ page! Stephanie’s experience and passion led her to open a program solely dedicated toward helping children – adults challenged (if not crippled) with a lack of social skills. We look forward to her future contributions in the area of social development but thought you would like to get to know her, given advice to parents during a socially awkward outing and the rapidly growing non-profit to watch, Starfish Social Club. Aspergers101: Tell us about Starfish Social Club. Starfish Social Club provides small group, direct social skills instruction to students with social learning challenges, ages 4 through adult. Students learn new skills, practice in a safe environment, and engage with similar peers in leisure activities on a weekly basis. The only requirements for enrollment are the ability to converse with peers and a desire to learn and practice new skills. Community outings (without mom and dad!) are available most weekends as well. Our goals are to increase social awareness and provide opportunities for students to form relationships with others. Aspergers101: What areas and ages do you serve? We serve students age 4 and up, including adults. There are no disability requirements; anyone with a social learning challenge is welcome. The majority of our students are on the autism spectrum. Most of our students have ADHD. Other common diagnoses are learning disabilities, anxiety, and mood disorders. We are located in the north central area of San Antonio and groups meet at our location. Aspergers101: Your resume is quite impressive, from special education administrator to the track coach for a special olympics team! What led/inspired you to launch Starfish Social Club? Students with social learning challenges are incredibly misunderstood. Students with social challenges but no ‘behavior’ issues are very often overlooked for services. These students go through school confused and often become socially neglected. Students with ‘behavior’ issues are really students with social learning challenges that aren’t being addressed effectively. These students go through school frustrated and often socially rejected. ‘Social skills’ can be a very vague, abstract concept and sometimes educators and parents are put in the position of teaching ‘social skills’ without really even understanding the complexity of it all. Social skills are much more than making and keeping friends, they are also about getting and keeping a JOB! There are lots of opportunities for someone with a high school diploma, but how many for someone who doesn’t know how to disagree appropriately? Has poor hygiene? Doesn’t filter their thoughts? Doesn’t acknowledge the presence of others? There is a saying that offense wins games, but defense wins championships. I believe academic skills win school life, but social skills win real life. My goal is to empower kids with the social skills they need to be successful outside of and after school. Aspergers101: You work with school systems, what do you see as the most challenging social struggles for students with special needs? Most students with Asperger Syndrome realize around 2nd/3rd grade that they are struggling socially. A lot of kids who struggle start to feel different and alone. While there are lots of kids with social challenges in the world, they aren’t always able to find each other. Most friendships are formed based on similar interests/goals/personalities. Our kids need to be around other kids they can relate to, and sometimes there are not other kids like them in their school. Middle school is rough enough, but middle school without friendships can be devastating. I don’t want to discount the possibility of our kids forming relationships with kids who don’t have social challenges, but as humans we are drawn towards others who are similar to us and with whom we feel comfortable. In my experience, kids with social learning challenges most often befriend each other. But they have to find each other first. Relationships give us a reason to want to better understand the social expectations. Without relationships the motivation to improve social skills is often lacking. Aspergers101: What is your advice to parents fearing social scenarios for their children diagnosed with High Functioning Autism or Asperger Syndrome? My strongest pieces of advice are to prepare as much as possible and to use unexpected moments as teachable moments. At Starfish Social Club we take ‘field trips’ almost every weekend. And things happen. We recently attended Family Day at the McNay. The event was outside, so before we started we ‘read the lawn’ to determine what the activities were, what the expectations were, etc. There is always a reminder that we stay with the group because we are there together. We decided to go inside to use the restroom so it wouldn’t be an issue the remainder of the time we were there. One of the students (high school age) ran down the corridor to the restroom. Ran! The last kid I would have expected that from. When he came out of the restroom we had a discussion about what everyone else in the corridor was doing (walking) and what the expectations were in a building (a museum especially). It is very important to me that kids know they will never be ‘in trouble’ at Starfish Social Club. Social missteps are not intentional. No one would intentionally choose to be socially out of step. I treat situations as a lack of knowledge, and my role is to teach. A few weeks ago at Morgan’s Wonderland, one of the kids greeted an employee who clearly has a form of dwarfism by saying, “Hey, tiny woman!” I responded by saying, “Isn’t it awesome how we are all different? We come in all shapes and sizes!” After we were out of earshot we had a conversation about only calling people by their names (she was wearing a nametag), which is something we talk about in our social groups as well. Sometimes kids with social learning challenges don’t have a concept of embarrassment since it requires an awareness of how others think/feel, so addressing things with concrete expectations tends to work better. If I say, “I bet that was embarrassing for her”, the student may not understand that. By reminding him of our expectation in the group about only calling people by their name, it is much more likely to be meaningful because it relates to a rule or expectation. Prepare as much as possible ahead of time. Tell your child where you are going, why, how long you expect to be there, and what to expect. When you get there, engage in a strategy called ‘read the room’. What do you notice? What are the expectations? What are most people doing? Don’t schedule social events with no plan. Center it around an activity or event. All our social outings involve going to a place to do a thing. Structure reduces stress. If you want to schedule a play date, where are you going to go? Maybe a park or themed event. Try to do it on neutral ground, not at someone’s house. The same is true for a ‘hang out’ for older kids. Base it around a structured activity like a trampoline park or movie. Give your child an out. What is the signal if they need a break? Where can they go? What can they do? Let your child come up with the goal so it’s meaningful to them. Sometimes I only focus on one thing with certain students. The goal for the day may be for him to keep his body in the group. Or for her to be flexible when her partner suggests a game. Or for him to follow the group plan instead of his own plan. After the activity, praise your child for all the things they did well, no matter how small. Did they greet other people? Did they share something? Did they ask someone a question? If it wasn’t super successful, don’t talk about the challenges. Save that for the next time you prep for something. Let your child have ‘me time’ after the activity. Social events can be stressful and ‘me time’ is both rewarding and stress relieving. Reward yourself as well. Supporting a kiddo with social learning challenges is tough work, and you are rocking it! 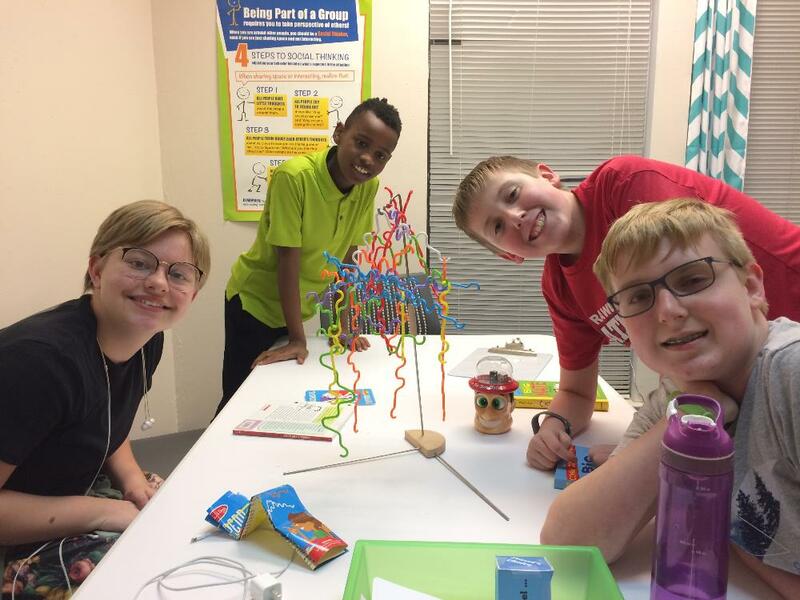 Starfish Social Club provides small group, direct social skills instruction to students with social learning challenges, ages 4 through adult. Students learn new skills, practice in a safe environment, and engage with similar peers in leisure activities on a weekly basis. The only requirements for enrollment are the ability to converse with peers and a desire to learn and practice new skills. For more information or to schedule a free initial appointment for your student, please visit us at www.starfishsocialclub.org.